Air India is going to recruit fresher candidates in India for Technical Assistant, Station Manager Posts. So, those candidates who are willing to work with this organization they May apply for this post. Last Date of Apply 03-January-2018. Total numbers of vacancies are 33 Posts. Only those candidates are eligible who have passed AME Diploma/ 3 years full time AME training Course complete certificate form DGCA approved Institute. 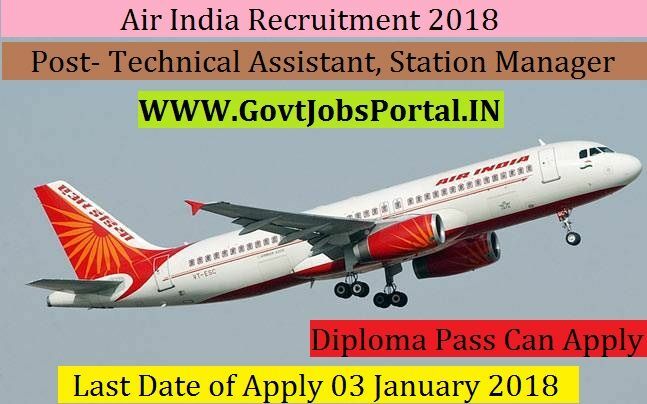 Indian citizen having age in between 18 to 40 years can apply for this Air India Recruitment 2018. Educational Criteria: Only those candidates are eligible who have passed AME Diploma/ 3 years full time AME training Course complete certificate form DGCA approved Institute. 2: Selection will be held on Technical Test.